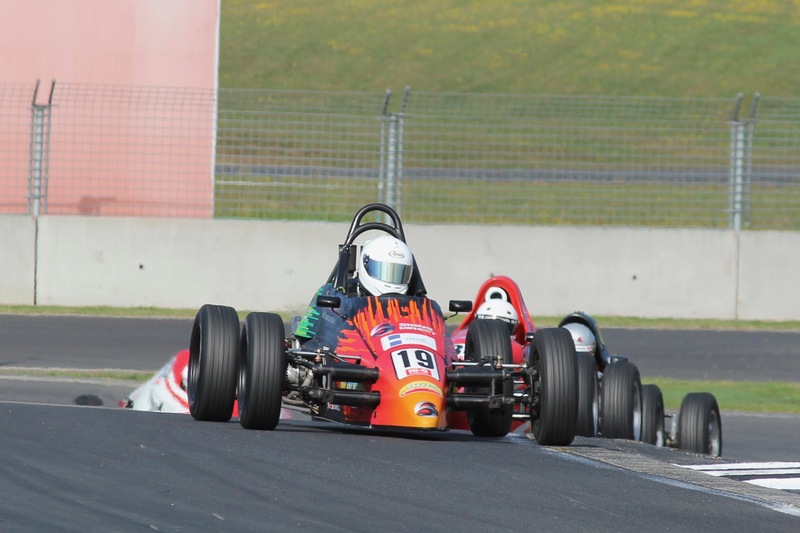 Reece Hendl-Cox has clean swept round three of the 2018/19 Hi-Q Components NZ Formula First Championship at Hampton Downs after taking race nine of the championship. Chris Symon, using Brody McConkey’s car, was unable to challenge Hendl-Cox in the final race finishing second by 4.4s. The battle for third heated on the final lap as suddenly four cars were vying for the position. Thomas Boniface, Liam Foster, Billy Frazer and Amy Smith ran four wide over the line to finish third, fourth, fifth and sixth respectively. Taylor Hurst and Ronan Murphy were the next battle pack, switching positions and exchanging drafts to try to catch the fight for the podium. Hurst narrowly edged Murphy to the line by 0.097s to finish seventh and eighth respectively. Ron Carter lead home fellow sunset driver Bob Dillow in ninth and tenth with Flynn Mullany, Dave Scammell, Kyan Davie, Nathan Sudiono and Bob Baker rounding out the field.